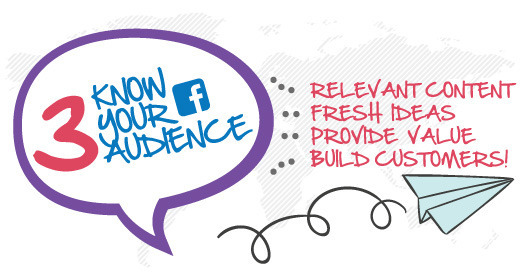 Facebook is one of the true stars of business social media platforms. Sure, it can be argued that it works better for certain sectors and industries than it does for others, but on the whole, every business can gain mileage and traction out of the platform. It’s easy to get carried away, but even a jaded and cynical business owner cannot ignore the fact that the platform has 1.19 billion users (and counting). While it is certainly not the case that every one of those 1.9 billion will buy from you (or even want to) you’re still left with a huge audience no matter which way you look at it. There are simply more people on Facebook. And with the improvements in data around Facebook (some of which is supplied by the platform itself) a business cannot fail to make good decisions on posting and management of the account. Well, almost. It’s true that Facebook is generally free to run for your company, and that it is full of ways to get involved and even start conversations with customers. But at some point you have to raise your game and ensure that your posts are going to be successful. It’s all about building value into your Facebook activity, so that your posts are useful, engaging, and bring some kind of return on your investment. 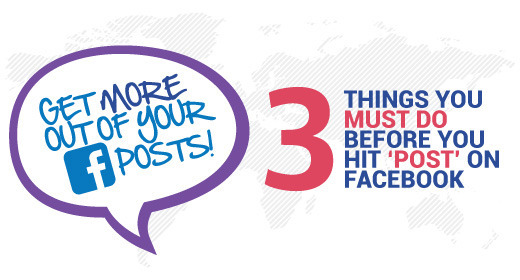 We’ve put together a list of 3 key things you should always do before you hit that big blue ‘post’ button on Facebook. 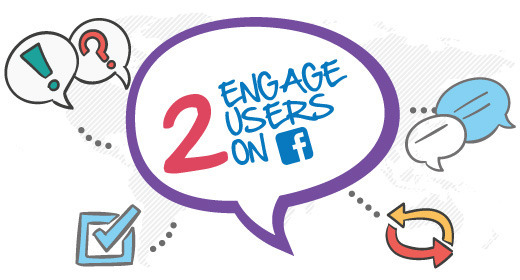 These 3 things are crucial if you are to find any real engagement on the platform. Additionally, they are not difficult to integrate into your Facebook routine. If you’re a social media manager for a company or an entrepreneur who needs to enhance her brand, the following 3 checklist items will help you move quicker and gain traction faster. There are a couple of ways you can do this, but one of the key methods is to ensure you have a strong image or video. Rich, colourful visual content always works best, and you should be making sure that every time you post an update, it contains imagery or video. There is no way around this, and there are no half-measures either. Make a commitment to finding high quality images or video content and using these on every post. This gets the attention of people and pulls them towards engagement. You could switch your game up even further and find unique imagery, perhaps even images you (or a team member) have taken. This is why so many companies find that an occasional shot of their office environment gets more response than they expect. If you sell a product, post a photo of it out there now and then. Or arrange a video (or Vine) and get it up there on Facebook. Anything visual has a bigger impact than a simple text only update. It’s as simple as that. But if you want to really become a true superstar when it comes to engagement with images, consider the trends. A survey from way back in 2013 found that images of body parts and products (like hands wearing watches, for example) worked best for retailers. Images of people wearing clothing, for example, didn’t quite cut the mustard. Your plan? Experiment. Test out your images and simply check back after a couple of months to see which images bring about the most likes, for example. This way, you get to craft your own Facebook image strategy and ensure that you get the most out of your investment of time and resources. Another way to ensure that your engagement increases is by considering the length of the update you create. The shorter the better really, and if you can keep your updates somewhere under 80 characters, it will ensure that they have more chance of engagement. Jeff Bullas (a major social media figure) found that posts of less than 40 characters are the real motherlode, receiving up to 86% higher engagement. The very best brands (and especially retailers) have real conversations with their customers on Facebook. It is a perfect platform for this, and it has proven to be a real winner, especially for smaller companies that have the ability to make things as ‘one on one’ as possible. Every time you post, ask yourself if you can give your audience an opportunity for feedback. This is something that you can do more than you think, and it should definitely be part of your checklist before you hit the blue button. So ask questions if you can. Ask your customers what they’re doing this weekend. Ask them to tell you what they like best about your product. The more you reach out, the more people will start to add to the conversation and bring you comments and further questions that you can answer as a business. Or run a competition. 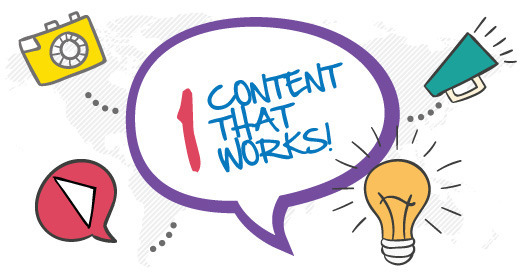 Something as simple as a ‘caption contest’ is a great way to build engagement, and get people involved. Competitions get people naturally interested in what you sell, especially if you offer it as a prize. And even if you’re just offering a discount, it’s still valuable. And while you’re at it, make sure that you respond to questions and comments as fast as is reasonably possible. If you’re interested in seeing how high the bar can be raised on this, check out XBox. This company has taken ‘the conversation’ to a new level on Facebook, and has managed to win a spot in the Guinness Book of World Records for being the most responsive brand on Twitter. But Twitter is just part of their social plan, and they have an average response time on Facebook of just 38 minutes. When you consider that they have millions of customers, that is no mean feat. Ferrari may not have a massive conversion rate on Facebook (it’s cars aren’t the average ‘shopping cart’ items) but it still has a 50 minute average response time on the platform. Finally ask yourself: Is this what my audience wants? This is something you can do every time you post. It is all too easy to crank out post after post, and it may feel like you’re getting somewhere. But at some point you will either hit a plateau or start to lose traction in the way of likes and shares. And that’s because you’re simply not putting out the stuff that your audience wants to see. You need to ask yourself every time you post if your content is relevant, timely, useful and/or engaging. It’s probably a good idea not to post too frequently anyway, but if you post a lot, and all you’re doing is sending out content that means nothing to your audience, you’re actually sabotaging your business. People will see the content, at least once, and they’ll make their own judgement. That judgement will generally mean that your content has no value to them. And no one sticks around when there is a perceived lack of value. If it isn’t, you are actually wasting time and resources. You should know your customers inside out. If you think you don’t, remember the last conversation you had with a customer. What question did they ask? What problems did they have? You’re looking for fresh and original content. Consider the speed and density of the feeds you see. Chances are, many businesses right now are not producing quality content, and they are not treating their audience with respect. You can change the game. Before you hit that ‘post’ button, make sure that you ask yourself if the content you are posting is something that your ideal customer would be interested in seeing. Is it something they would tell their friends about? Is it something that would make them stop what they are doing and look? You know your customers. So give them the content you know they need. Otherwise, you will not be engaged with, and your standing among current customers and prospects will be lowered. Take the time to know your industry and post only things that are really newsworthy, or which have an obvious interest and relevance to your audience. And the keyword here is ‘obvious’. There are many other ways to get more out of Facebook for business but we firmly believe the above 3 concerns should be front of mind every time you are about to click on ‘post’. It is important to ensure you have every chance of garnering quick engagement with smart post lengths and high quality use of imagery and video. It’s also important to find ways to frequently start a conversation. And finally, and most vital of all, it’s your job to ensure that you never hit ‘post’ without confirming that what you are sending out there is relevant to your audience.